Volvo DD110B large asphalt compactor. Successful asphalt paving projects don’t happen by accident. They are the result of careful planning and appropriate preparation. From proper paver setup to achieving optimum mat temperature and conducting the rolling pattern at just the right time – each step in the process will impact the next. And attention to detail throughout the process can mean the difference between getting a bonus and being delayed. It all starts with proper paver setup. It’s essential to inspect the paving machine and components to look for any issues that could affect operation or safety before work begins. Prior to startup, check all fluid levels. Start up the paver and then check all gauges. Apply a release agent or coating solution to any components that come into contact with asphalt throughout the workday to help prevent it from sticking to bare metal parts. Some paver manufacturers have developed integrated coating systems operated through the machine. 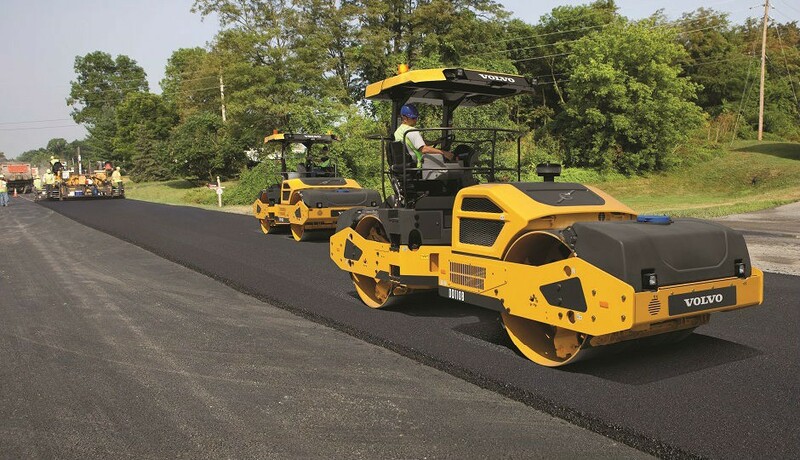 Volvo pavers, for example, utilize Blaw-Kote, a coating system that can be used on the complete machine, and if equipped, can be applied to the tracks with the push of a button. Proper machine preparation and screed setup can save time and effort. Set up the screed to the project specs – width, mat thickness, crown or slope – and preheat the screed to prevent mat sticking and dragging. A temperature range of 225ºF to 275ºF (107ºC to 135ºC) is typical. Establish the screed-plate angle by rotating the depth cranks up or down to the desired paving depth. The angle of the screed will increase or decrease the mat thickness. A project engineer who determines the estimated usage and traffic volume for the intended pavement establishes the mat depth. After ensuring the paver is in top working condition, the crew must then focus on the factors that will yield the best quality pavement. Material level and paver speed both play a significant role in determining pavement quality. The two most important factors for laying a quality mat are all about consistency: consistent head of material in front of the screed and consistent paving speed. More than 95 percent of all material faults in asphalt paving are due to an improper head of material in front of the screed. The “head of material” is the mass of paving mix that lies directly in front and spans the width of the screed. If this fluctuates widely during paving, it is nearly impossible to produce a level and smooth pavement surface. An increase in the head of material increases mat thickness and can translate into a wavy surface, and a decrease reduces the mat thickness and causes major flaws. The correct head of material should be constant across the entire width of the screed. While monitoring material levels is the responsibility of the screed operator, many machines are now equipped with automatic feed systems that use sensors to automatically regulate the proper delivery and flow of material in front of the screed to ensure smooth and consistent paving. Ripples, waves and irregular mat depth can occur when paving speed doesn’t remain relatively constant. In an ideal paving operation, the paver will operate nonstop throughout the day, because a change in paving speed can directly affect the ability to lay a uniform mat. Speed changes also create challenges with timing the delivery of hot mix material in order to keep the hopper at least one-third full. Consequently, changes in paving speed are commonly caused by trucks inconsistently arriving at the jobsite, or bumping the paver during the truck exchange. When setting the paving speed, consider the number and size of trucks, volume and output of the mixing plant, rolling and compaction rates and crew capabilities, plus the distance from the mixing plant to the paver. Speed limiters, similar to an automobile’s cruise control, are available on some paver models to control paving speed. With the paver properly set, and the mat laid with correct of material and consistent speed, it’s time for the compaction operation. Pavement must cope with unexpected loads, heavy traffic and – depending on location – harsh winters. Compaction best practices will preserve asphalt integrity and delay the need for road maintenance. Without proper compaction or densification, the finished roadway won’t provide sufficient support needed for structures or traffic loads, and material will eventually break down. Three key factors contribute to quality compaction: mat temperature, mat depth or thickness and compactor rolling patterns. The first rule of compaction is to monitor mat temperature. Compaction must be accomplished while the mix has enough fluidity to allow aggregate particle movement in order to remove voids and excess air in the pavement structure. In some instances, the time available for compaction can be limited to 10 minutes. The cooling of hot mix asphalt is predictable and can be anticipated based on prior experience and current ambient conditions. A compactor operator should keep notes on projects and different types of materials to determine best temperatures. Once this is set, it’s important to work in that zone all day. Thickness is also an important compaction factor. A project engineer who determines the estimated usage and traffic volume for the intended pavement selects the mix design and establishes mat depth or thickness. It is initially part of the paving crew’s responsibility to set the correct angle of attack, but compaction plays a role in the “finished” mat thickness. A rule of thumb is to assume a 20 to 25 percent compaction to the final goal thickness. With a properly laid and compacted mat, the final step in the process is the rolling pattern. Maintaining a precise rolling pattern is the final, and especially crucial, step in the road building process. It determines road smoothness and contributes to the long-term stability of the road. It’s essential to complete rolling before the mix temperature drops too low to achieve target density. This practice allows the highest production to be achieved and, for mixes exhibiting tenderness, proper breakdown rolling density can be reached before the mix becomes unstable or develops a tender zone. It is also important to carefully place your passes with the compactor and stop forward motion at a slight angle to prevent bumps and depressions in the pavement. Always stagger stops down the mat to avoid stopping in the same place, and change direction slowly to avoid imperfections. Limiting the length of the rolling zone also helps the compactor keep up with the paver. Intelligent Compaction (IC) has gained momentum in the industry over the last decade, and for good reason. IC technology allows for better record keeping, increased compaction uniformity, automation and increased productivity for road crews that ultimately saves time. However, previous IC systems were missing an exact density measurement, data critical to the integrity of the finished road, and more accurate measurement than mat stiffness alone. Density Direct from Volvo Construction Equipment – launching in late 2015 – provides this critical information to the operator through an Android-based touchscreen monitor, similar to that of a smartphone. The Density Direct interface displays a map with colour-coded density readings in addition to the numerical reading for density, the number of passes and temperature. When fully calibrated, the density calculations have been shown to be accurate to within 1.5 percent of the measured value of core samples. To learn more about operation and safety, training programs from manufactures can be a valuable tool. For example, Volvo Road Institute conducts courses by professional instructors who are focused on helping paving contractors and those in the paving industry maximize productivity through various paving and compaction best practices, as well as machine performance and maintenance. Precision and efficiency don’t come from equipment alone – people make the difference. Chris Connolly and Wayne Tomlinson are training specialists at Volvo Construction Equipment Road Institute. All material faults in asphalt paving are due to an improper head of material in front of the screed. The “head of material” is the mass of paving mix that lies directly in front and spans the width of the screed.